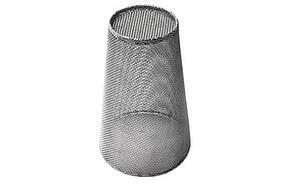 Metal filters are used primarily in commercial and industrial/OEM applications. In some applications the goal is to protect downstream components from particulate matter. 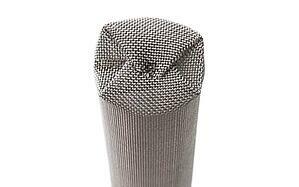 In other cases, a metal filter can be used to separate, or screen one substance from another. 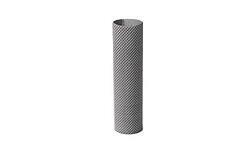 Whether your specific application calls for removing unwanted contaminants from fluid or air, protecting expensive process equipment, or simply separating one material from another, Yankee can manufacture a custom metal filter for your exact specifications from wire cloth, perforated metal, or expanded metal. Why compromise performance with a stock solution when a custom fabricated metal filter can deliver the perfect size dimensions and performance characteristics desired? 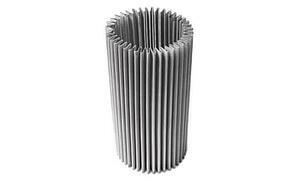 Metal filters are excellent for use in applications that will include continuous exposure to liquid or moisture, or where paper filters do not offer sufficient rigidity or strength. 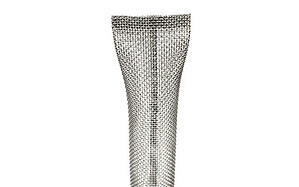 In addition to outstanding durability, there are other inherent design benefits available with metallic filters. 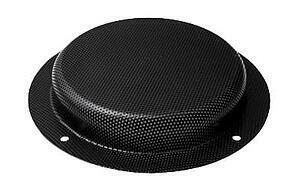 Metal filters can be fabricated by welding and crimping, eliminating the need for adhesives or epoxy bonding. 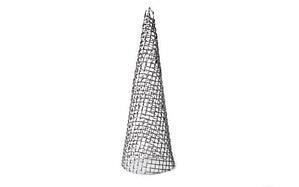 Unlike paper filters, metallic filters can withstand temperature range in excess of 500 ° F. and can withstand extremely high differential pressures. 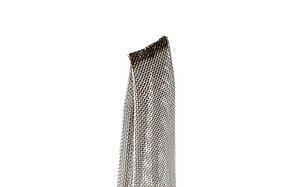 Depending upon metals used, your filter can be compatible with most caustic fluids. 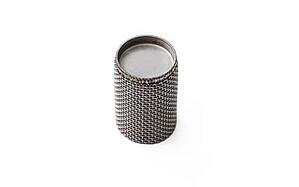 Stainless steel filters, for example, offer a high degree of resistance to corrosion in caustic environments. 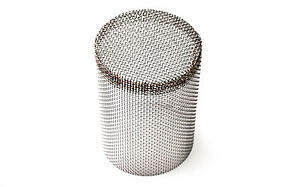 Best of all, metal filters are inherently cleanable and reusable. 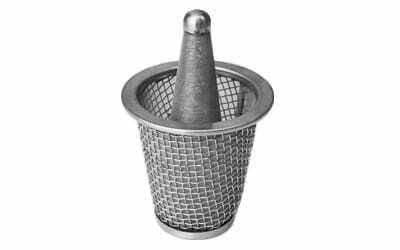 Reusable metal filters offer superior service life when compared to paper and cloth filters, and are commonly used in metal cutting, engine and compressor oil, and wastewater applications. 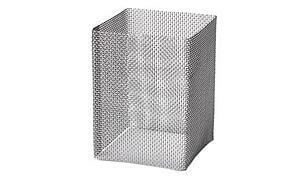 Metal filters are designed from three basic materials: wire cloth, expanded metal and perforated metal. Each material has its own flow rates and individual characteristics making it a “best fit” for particular engineering requirements. 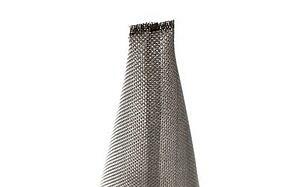 For example, perforated metals can be selected with round holes, square holes, or any other shape required based on size and or shape of the particulate that needs to be strained or filtered. 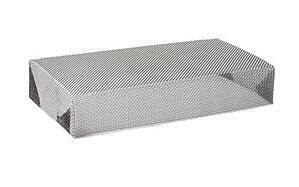 Expanded metal and perforated metal filters offer superior rigidity and durability to wire cloth filters. 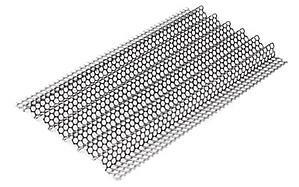 For filters that require intricate bends and pleats to achieve proper performance characteristics, and where durability is less of a concern, wire cloth filters in mesh ranges from 2 x 2 to 5 micron mesh are the clear choice. 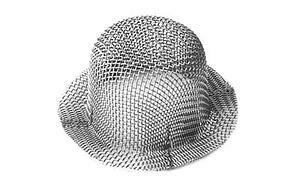 In some applications, filter design requires a mix of materials for support or to develop a protective underlying or outer structure of expanded or perforated metal or a coarser mesh that guards delicate pleated interior components. Metal filters can be formed using a variety of techniques. The specifics of your filtration requirement – particles size, GPM flow rate, contact liquid as well as the physical space limitations into which the filter must fit all affect the construction type and the filter end formation.